Oh don't worry, I will. I put it on the cart to roll it over to weigh it. 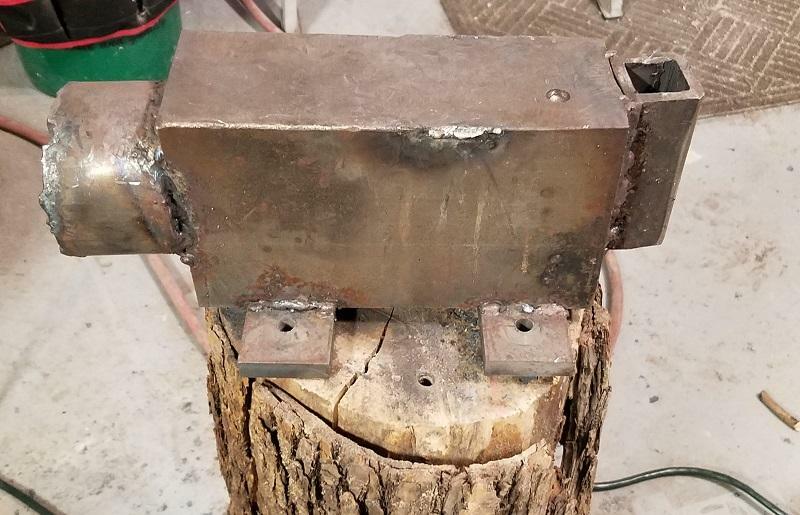 So you think it's a fisher anvil? How old do you think it is. I'll take a wire brush and try to look for some markings tomorrow. You seem to be an expert frosty. Is this of for a beginner or should I get something a little smaller. And if I were to sell it what do you think I should ask? Russell, Frosty was answering Dave. Yours is not a Fisher. Ah, I'm hardly an anvil expert, there are just some things everybody needs to get right. Unless I'm not seeing it right that's the Fisher "Eagle and Anchor" logo showing in the first Pic. Maybe too heavy? You sure don't hear that often, what's it weigh? She's an excellent beginner or master best known for being quiet. Your neighbors will thank you. Yeah, I'm confused I was confusing before and after pics of Dave's anvil. Who was it accused me of being an expert? I was JINXED! That's my story and I'm sticking to it. Russell has the Colonial anvil and Dave has the Fisher.... I'm so confused. The 1949 TV serial Lone Ranger is on. I'm going to have a cookie and not say anything for a while. A cloud of Dust and a hearty Hi--Oh Silver! Nice Fisher Dave but get off that plastic cart before trying to use it okay? She needs a solid stand under her to do her job properly. I wasn't planning on using it on that cart. I only put it on the cart to clean it and move it around. Thank you for looking out for me though. Nice weight anvil Lars. Excellent condition and I'm thinking maybe cast Swedish steel? SWEET. I like the little corner lug mounts too. You're giving me ideas here Lars. I'd already sent the post when I took another look and it's obviously not cast. Swedish steel though! Ahhh, close. I don't know what those are really called, lugs just came to mind and they're on the corners so that's what I called them. 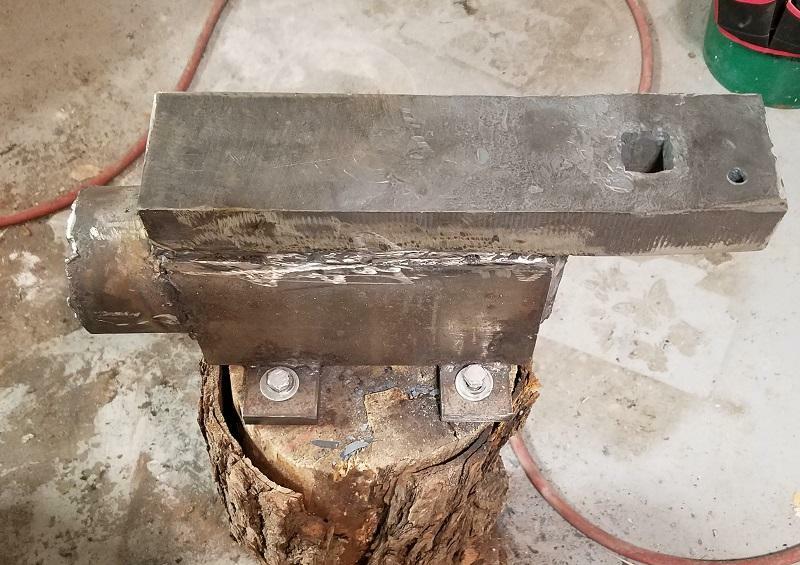 The look like they want to rock forwards a little when you tighten the lag screws and put a pinch on the anvil foot. Yes, no, maybe? My pleasure. Do the lugs put pressure against the feet? Or just hold it from sliding around.. Very nice.. Hard to tell from the pictures.. Yes they do, that's why the bolt-screws have that angle. I think the fact that you have 2 at each foot is the best part since they will lever against each other and hold for a very long time. It was a fine day in the workshop. My original ASO, in use for the past year, got an update today! I saw a large bar of A2 tool steel on the off-cuts section at my steel supplier. $1.20 per pound. 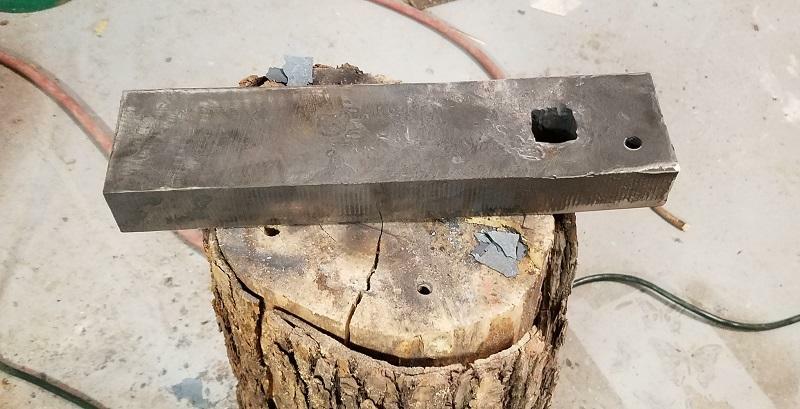 My old ASO was a 45 pound block of cold rolled steel. No rebound. My hammer bounces off the new top. I have a larger, heavier plate for the bottom that will take the total weight up to about 100 pounds, but I need a bigger stump first. 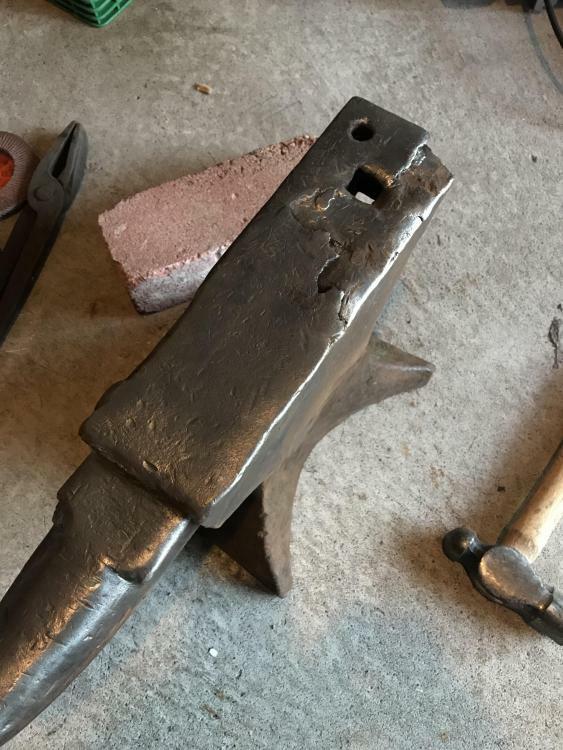 HikerhohnsonI: I would love for him to post a picture of his portable anvil.. much like the one shown.. 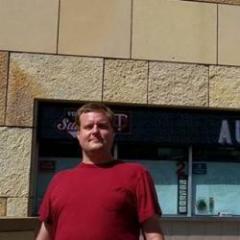 Pretty cool..
Dan: That isn't an ASO by a long shot. ASO stands for (Anvil Shaped Object) and refers to cheap cast iron objects that LOOK like anvils but won't work like one. 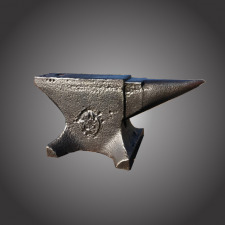 The definition of anvil is something you beat against, by definition you have an anvil. It just isn't a London Pattern anvil. The world is full of excellent work done on anvils that look nothing like London Pattern anvils. Your anvil is a fine example. 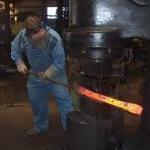 Show us some of your forgings, we LOVE pictures. Well, what's up with it is the face plate on the tail is delaminating and much broken off. 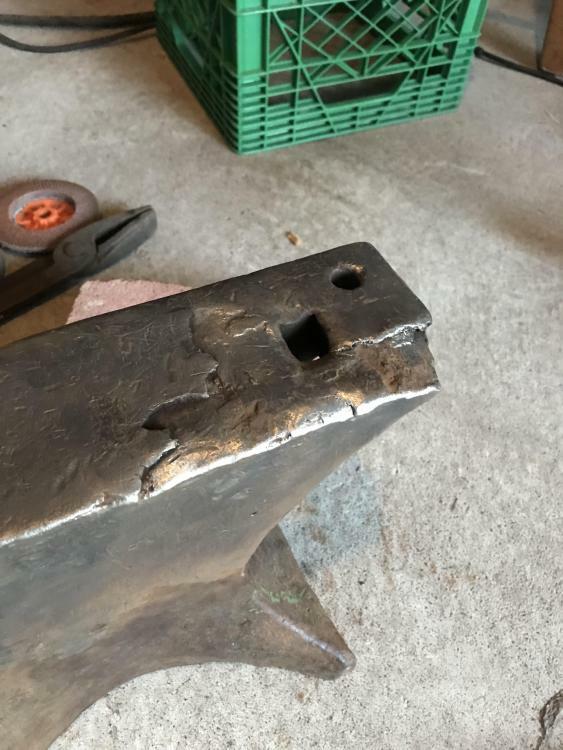 The good news is it looks like it's still a perfectly usable anvil. At least mostly half of it which is fine. Looks like the pritchel hole is still usable, and you can still use hardy tools in the hardy hole but I wouldn't do heavy hitting back there. 0.3.12 in hundredweight would have been 96#. They were usually give or take 10# and probably a little less with the missing pieces. No worries tho, you have a usable anvil there. Just avoid hitting on the edges where the faceplate is broken. To me it looks like someone who didn't know what they were doing tried to weld up that area and it came loose. Trash? TRASH?!? You do realize that you’re talking about The Undisputed King of Anvils, don’t you? As noted, though, it’s been through a lot. The good news is that it still has its face, and so long as it isn’t delaminated, you should be fine. Tap it lightly over the face to see if you hear any changes in pitch: a solidly welded face will have a nice clear “ping”, while a delamination will have more of a “whack” or even a “thud”. 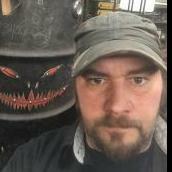 Anywhere that pings should be safe for use. Thank you for the info. Much appreciated!